Warning: this editorial may contain triggers for individuals who are highly sensitive about being asked to consider the unintended consequences of their habits, and maybe also their sense of entitlement and self-importance, if they have those in any inflated measure. The old Rossland tradition: it seems that just about everybody does it, contrary to a Rossland bylaw. This past year, according to the Bylaw Enforcement Reports, 78 people received warnings, and three people were ticketed for it. One or more of our Rossland Council members seem to think that ignoring this particular bylaw is no big deal, and that our enforcement officer should just turn a blind eye and concentrate on more important things. Others may or may not agree. But in case anyone cares, what is the law on jaywalking? I recently saw a blog citing Section 180 of the Motor Vehicle Act (MVA), which requires pedestrians to “yield the right of way” to vehicles if the pedestrian is crossing a highway at a point other than a crosswalk. Our municipal Council long ago took advantage of that section to enact Bylaw # 1977, which prohibits pedestrians in Rossland from crossing “any highway other than at a crosswalk.” It prohibits a lot of other things too, as bylaws tend to do, but that’s one of them. What’s a crosswalk? That’s defined in the MVA too. It’s not just marked crosswalks – a pedestrian is “in a crosswalk” if (as just one example) she crosses Columbia Avenue on the west side of the Columbia Avenue/ Washington Street intersection within the unmarked area that would be enclosed by lines marking an extension of the sidewalk down the west side of Washington street and across Columbia Avenue. The same applies to any other intersection: unmarked crosswalks are still crosswalks, and pedestrians in Rossland are obeying the bylaw if we cross the highway in the unmarked crosswalks too. But what’s wrong with jaywalking? I hear all the (other) habitual jaywalkers bleat – where’s the harm? WHY should it be against the bylaw to just wander across Columbia wherever and whenever I feel like it? Could it be because drivers along Columbia Avenue are often on the look-out for a parking spot, and shouldn’t also constantly have to be on the look-out for scoff-law jaywalking pedestrians? Could it be because drivers backing out of a parking spot are probably looking over their right shoulder, as required, to see approaching traffic in the lane they’re trying to back into, and shouldn’t be expected simultaneously to watch over their leftt shoulder in case some oblivious illegally jaywalking pedestrian might be about to walk behind their vehicle from the other direction? Of all the people who died in BC as a result of “motor vehicle incidents” from 2013 to 2017 inclusive, 17.5% of them were pedestrians, according to ICBC statistics. 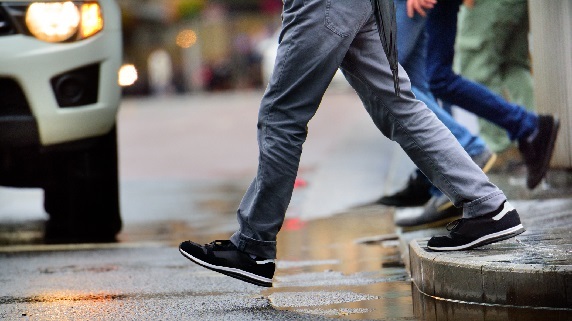 In our Southern Interior region of BC, about 270 pedestrians a year (based on a five-year average) are struck by vehicles and injured enough to become ICBC statistics. According to ICBC, Rossland has had an average of one "pedestrian-involved crash" per year; in 2017 there were two. I haven’t been blameless in the jaywalking department, but I can see why a prohibition against jaywalking is a reasonable safeguard against injuries to pedestrians, not to mention preventing potential PTSD for drivers. More of us should honour that prohibition, and should stop setting a bad example for children; I’ve been appalled to see mothers leading their young children across downtown Columbia Avenue in the middle of the block in the face of traffic, which fortunately was able to stop for them – but should not have had to. I don’t make New Year’s resolutions, but having thought about this issue I’ve decided to become a better pedestrian by avoiding jaywalking, especially in the downtown area, and to voice my support for the bylaw prohibiting it – and for having our enforcement officer continue to warn and ticket jaywalkers. It’s a safety thing. Besides, children who learn bad habits about jaywalking in Rossland are arguably more likely to do it in other places where the consequences could be more severe. Teaching children to break traffic laws and increase their chances to suffer injury or death isn’t my idea of a good solution to the earth’s over-population issues, or to the high cost of car insurance. I suggest that we need to restrain some of our desires for instant gratification and look beyond the idea that getting where we want to go a few seconds faster is more important than anything and anyone else.